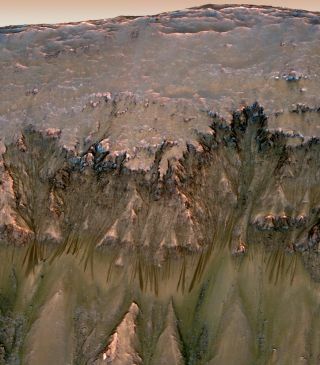 The tantalizing seasonal flows observed on Mars last year may indeed be caused by liquid water, a new study suggests. The melting and subsequent evaporation of frozen salty water could cause the intriguing dark streaks, researchers said. These lines, which were spotted by NASA's Mars Reconnaissance Orbiter spacecraft, extend down some Martian slopes during warm months and fade when winter comes. “In one day we could form enough liquid to create these flow features on the surface," lead author Vincent Chevrier, of the University of Arkansas, said in a statement. Chevrier and co-author Edgard Rivera-Valentin, now at Brown University, modeled the behavior of water-and-salt mixtures called brines. Salts can lower the melting point of water, explaining how brines could conceivably flow on Mars' frigid surface. The researchers plugged different forms of salt into their model, attempting to find one that exhibits the desired behavior. "We had to find a salt-water mixture that would come and go," Chevrier said. They determined that calcium chloride fits the bill. In their models, the researchers could melt enough calcium chloride brine that it would not all evaporate immediately, leaving some liquid behind to conceivably create the flow features. The researchers say their model fits the observed phenomenon well. For example, it explains why the streaks — known as Recurring Slope Lineae — occur seasonally on equator-facing slopes, and why imaging spectrometry on Mars hasn't identified water signatures in such places (because the liquid would evaporate quite quickly). "No other current model really explains all the observations," Chevrier said. Evidence abounds that water once flowed across many parts of Mars billions of years ago. NASA's Spirit and Opportunity rovers found many signs at their disparate landing sites after touching down in 2004, for example, and the agency's Mars rover Curiosity rolled past an ancient streambed just a month or so ago. Scientists have long viewed the modern-day Red Planet as a dry and dusty place, however, which is why the discovery of the seasonal flow features last year created such a stir. Here on Earth, life teems wherever liquid water is found. So if Mars is wet today — even if only seasonally — the planet may be a better candidate to host life than scientists had thought.